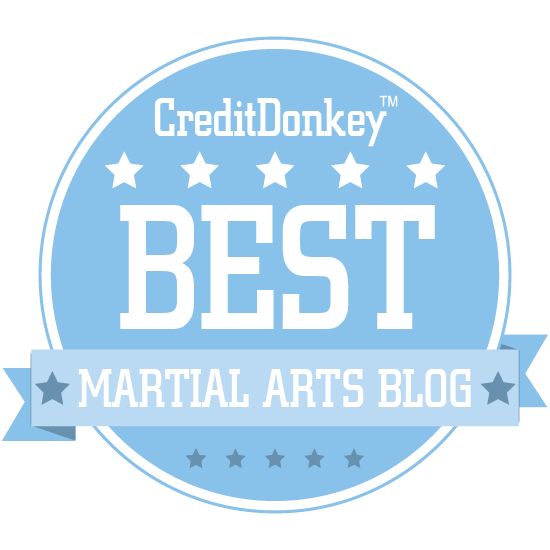 Recently a fellow sent me an email concerning my article "The karate "kamae" or guard". 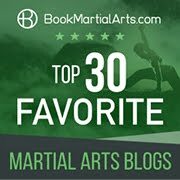 My original video relating to the karate kamae in which I discuss the "Clayton's gap"
In that article I discuss how the old bareknuckle guard and the karate kamae (guard) are basically the same, and for good reason: if you are fighting ungloved, it makes little sense to hold your clenched fists close to your face as having them rammed into can be almost as bad as taking a punch full-on. Rather, with the fists held out at a distance you can not only avoid this problem, but you are also in a position to use what are called "blocks" (better termed "deflections") to intercept an attack closer to its source (rather than when it has almost reached full extension and is travelling at its full speed). I also described how one of the benefits of the bareknuckle guard is that it incorporates a subtle gem I call the "Clayton's gap". 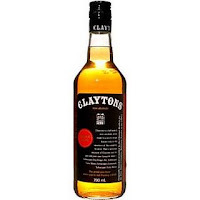 For those who don't know, "Claytons" is a non-alcoholic drink that looks like whiskey and that was marketed extensively in Australia and New Zealand in previous decades as "the drink you have when you're not having a drink". The term has now entered the Australasian lexicon as a general descriptor of something that is fake or flawed. I use the term "Clayton's gap" in the context of the bareknuckle guard to describe an apparent gap in your defence: a gap that appears to allow your opponent to jab directly at your face with his/her leading arm. In fact, there is no gap. 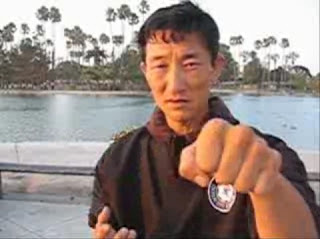 If your opponent tries to throw a straight jab through that gap he/she finds himself redirected at the very last moment. 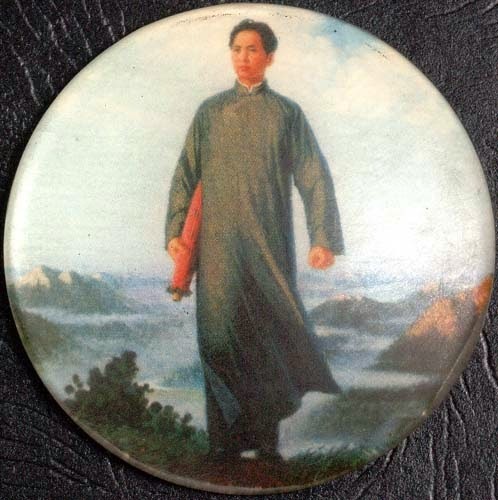 My correspondent expressed grave skepticism about my argument, the whole concept of the karate kamae and my suggested relationship to the bareknuckle boxing guard. First, he ridiculed my original video by saying that it proves nothing: I had clearly prearranged the attacks and they were being delivered by a very compliant student. Furthermore, the attacks were not realistic. In this context, he lampooned my "continual instruction" of the student about how to punch me. He also noted that the guard was easily overcome by a hook on the outside. These points would be all well and fine if the purpose of that video was to show a "fighting technique". It was not. I was attempting to show the angle of deflection inherent in the guard and the "Clayton's gap" - not how I would apply the guard in free fighting. In free fighting I would not stand around stiffly, holding my arms out like a statue. I would not expect certain punches nor instruct my opponent how he/she should punch me. But I had to do so in the first video for the purposes of illustrating the vectors and trajectories in a "snapshot" of time. Period. Which brings me to the next point made by my correspondent: He states that I have completely misunderstood the old bareknuckle guard. As he (rightly) says, old Victorian-era bareknuckle fighters used to circle their arms to confuse their opponents. They didn't stand around stiffly like statues. Accordingly he maintains that in making my argument I have relied upon incorrect assumptions based on static photographs and without regard to how those fighters moved about. Again, this argument would be valid if I had actually assumed that these old fighters did stand around like statues. I have never assumed that. I was well aware that many moved their arms in a circular fashion. In other words, I never sought to argue that they fought with stiff, unmoving guards, in much the same way as I have never advocated using the karate guard in this fashion. As I've said: my original video was intended to discuss fine angles - not how the guard can/should be applied. 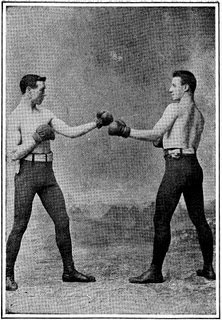 The salient point is this: While some bareknuckle fighters of old did employ a circular motion with their arms, their arms were continually moving through the bareknuckle guard posture - with all the attendant benefits of not having their knuckles rammed into their faces, having the ability to intercept punches early and being able to rely on the "Clayton's gap". 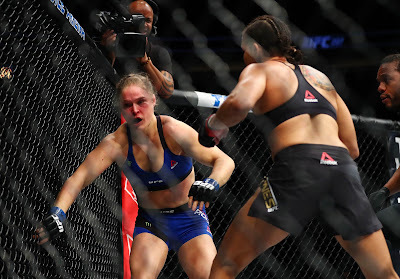 In a similar same way, karateka should not fight with stiff guards. 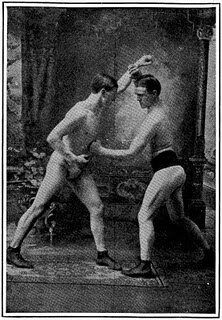 Rather, they should continually move their arms through the guard posture - not in the circular fashion of the old bareknuckle boxers, but naturally in the context of the dynamic melee range environment in which one is punching, deflecting, trapping, grappling etc. And always with an eye on factors such as the "Clayton's gap". 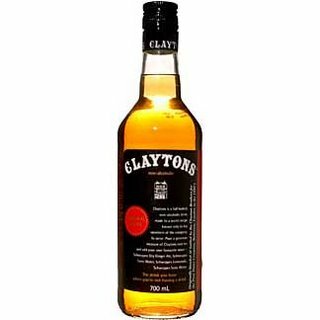 It is important to note that factors such as the "Clayton's gap" are no panacea: they do not provide any kind of guarantee of success. They are just little factors that you might as well use to your advantage. For example, why create a real gap, when you can create an apparent, but non-existent one? So, with respect to my correspondent, to suggest that my first video purported to advocate standing stiffly like a statue with the arms in the bareknuckle guard misapprehends my point - and sets up a straw man. My correspondent is ultimately guilty of the very thing of which he accused me: he looked at my discussion of a "snapshot" in time and made flawed assumptions based on that. Perhaps this is understandable in the context of my first video, which did not go into detail about the application of the guard in a dynamic environment. If so, I hope this article (and my second video) corrects any such misimpression. 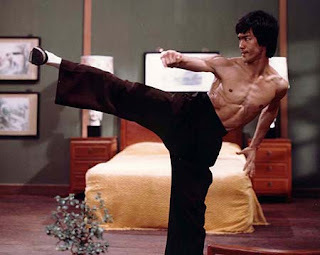 Interesting note: Open the hands and you have the Wing Chun standard guard. It's amazing to me how so many different styles can boil down to the same fundamentals (when taught correctly, of course). 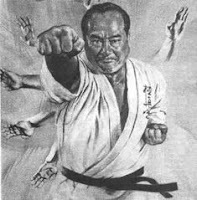 The closed fist guard is just one variation in karate; you can also open the hands, turn the hands over etc. This is why the basic chest deflections of karate all utilise the same biomechanical structure. And it is for this reason that I can definitively say that George Dillman's sanchin (as noted in my previous article) is fundamentally flawed. Furthermore, I believe that the art of Kwang Sai Jook Lum employs the same concept of this gap. 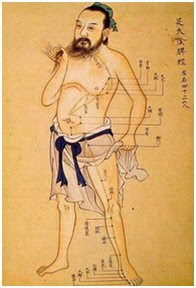 It has an open guard (very similar theories to wing chun) and proposes that having this false gap will ensure a defensive posture for the first line of defense. Thanks for the articles. 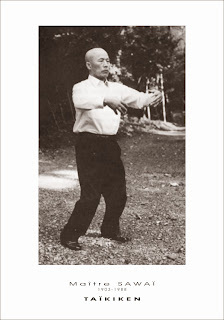 I apologize for posting again I said Wing Chun earlier, however the video displaying the chudan uke with both arms out in a very Goju Ryu posture is reminiscent of Southern Praying Mantis. Either way, I agree that many of these arts (taught correctly) share effective fundamentals. The Aikido ready position also has the arms out that way but with open hands (and in some foolish schools, open fingers). Fascinating discussion. I believe that this misunderstanding over the Clayton’s gap issue comes from improper comprehension of the difference between technique and tactics in martial arts. In that sense, Clayton’s gap is a technique that comes from tactics of trapping your opponent by leading him into a move that may be predicted and thus easily exploited. Clayton’s gap is in fact a very subtle trap; it’s not really a guard (though it can serve that purpose) but, as you mentioned, an illusion of a misplaced one. I guess the most important point for keeping your elbows close, apart from creating the Clayton's gap, is to protect your ribs. The closer the guard is to your body, the easier it is to you to defend against a hit against the ribs. But I guess that's obvious. Last day in class we sparred (yeah, cool randori style!) and our teacher told us not to close our hands; he said "If you close your hands, that means you're afraid. Don't be. Just play." It was funny. Yes, it is said that the original kanji for shisochin might have been "chisaukin" meaning mantis/cricket battle. 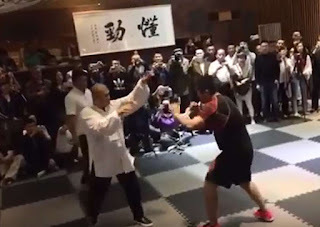 When you look at the finger thrusts of shisochin you start to see some similarities to the Hakka systems of which southern preying mantis is one, white crane is another and bak mei (white eyebrow) also another. and it is easily adaptable from Geoff Thompsons 'the fence' self defence posture. Excellent. Fascinating Brenda. You know, I've never actually tasted the stuff (although I remember it was used in a play at school to simulate alcohol, but my part didn't involve drinking the stuff). I get the impression that Clayton's probably doesn't age well. In fact, it might well be unsafe to drink given that it isn't alcoholic (and therefore doesn't have anything in it that would kill bacteria). Perhaps some enthusiast will still want it as a collector's item... I'd put it on ebay. See what happens! Good luck and thanks for reading.